Ultra Document To Text is the fast and affordable solution for converting PDF, RTF, DOC, DOCX, PPT, PPTX, XLS, XLSX, HTML and MHT documents into text files. Ultra Document To Text has an easy to use UI. You can click "Add File" button to add the PDF, RTF, DOC, PPT, XLS, HTML and MHT files you want to convert or directly drag PDF, RTF, DOC, PPT, XLS, HTML and MHT files from explorer to the list. Ultra Document To Text function is also available as a standalone ActiveX component which provides the functionality to convert various document into text. The component can can be easily integrated into applications written in languages that support ActiveX Component such as Visual C++, Visual Basic, Delphi, C++ Builder, .Net languages, Java, Scripts like Perl, Php. See the FAQ section below on how to use the demo. * Support typical PDF format. * Convert PDF to text in batch mode. It is a tool for fast converting lots of files and editing them. Easy to use -Intuitive interface to guide you through the conversion process. Produce reference documentation and reports for SQL Server databases. Qweas is providing links to Ultra Document To Text Converter 2.0.2012.115 as a courtesy, and makes no representations regarding Ultra Document To Text Converter or any other applications or any information related thereto. Any questions, complaints or claims regarding this application Ultra Document To Text Converter 2.0.2012.115 must be directed to the appropriate software vendor. 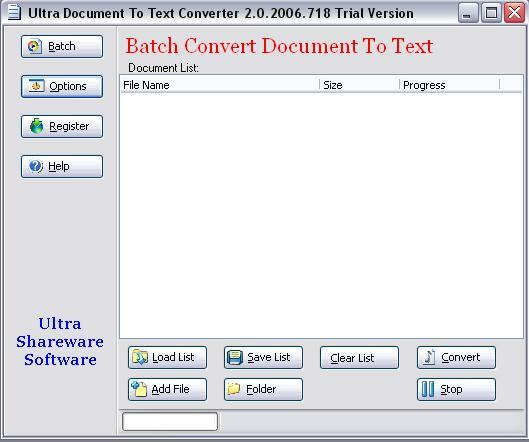 You may click the publisher link of Ultra Document To Text Converter on the top of this page to get more details about the vendor.